A fresh approach to mindful living. 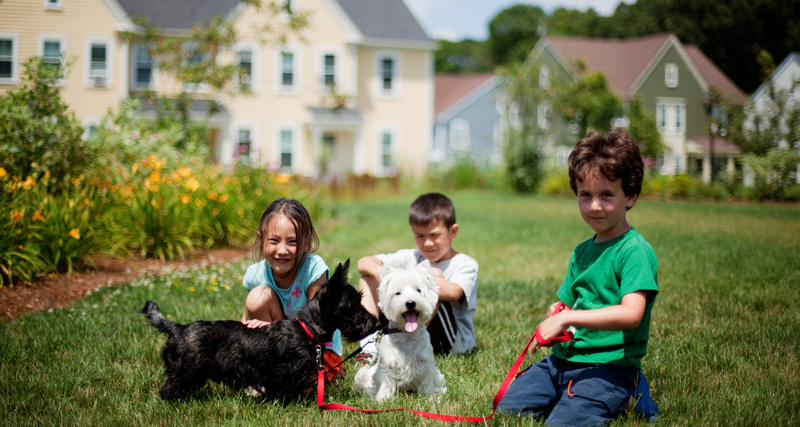 The award-winning team behind Emerson Green has created some of the most innovative residential communities in New England. Under the direction of veteran developer Dan Gainsboro, NOW Communities creates community-focused neighborhoods that emphasize sustainability and energy efficiency. 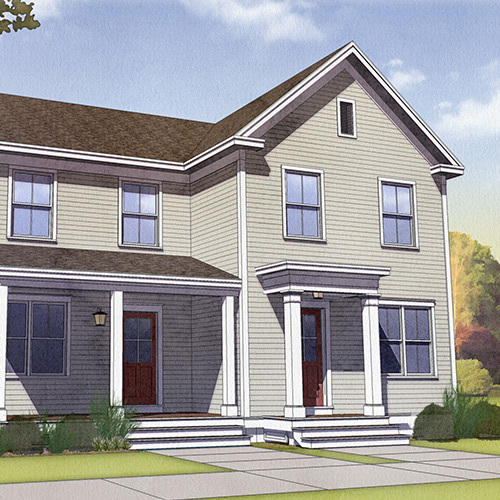 The firm’s first major residential development, Concord Riverwalk, was an immense success – earning acclaim from planners, architects, and environmentalists alike, and generating tremendous demand for its cottage-style units. NOW Communities has been recognized with some of the architecture and urban development industry’s most prestigious awards, including Builder Magazine’s Project of the Year, the National Association of Homebuilder’s Community of the Year, and the American Institute of Architects’ New England Design Honor Award. Union Studio (formerly Donald Powers Architects) was founded in 2001 with the goal of making an impactful civic contribution to communities of all types through exemplary architecture and urban design. The firm served as the architects on the Concord Riverwalk project and received an Honorable Mention from the New England Chapter of the American Institute of Architects (AIA) for their work on the project. The Union team embraces a traditional, pedestrian-friendly approach to design featuring vibrant, beautiful spaces that help to enrich our communal and civic life. Ajax Partners is a team of dedicated and experienced real estate professionals assembled for the purpose of investing in and developing a multi-sector real estate portfolio. The team has extensive real estate experience accumulated through hundreds of project transactions with a value in excess of $10 billion. Ajax is committed to developing and managing assets in a sustainable way, and their team approaches sustainability with respect to the relationship between the economic, environmental, and social factors that affect a site, its occupants, and the surrounding community. The firm has been involved in numerous residential projects in the Boston metropolitan area as well as ventures in New York and Philadelphia. Previous local projects include Brookside Mill, a 40,000-SF mill building in Westford, Mass., which was converted into luxury loft condominiums. Communities Designed by Union Studio and Now Communities. Riverwalk is a compact “pocket neighborhood” of 13 Net Zero possible homes, carefully designed with details and systems that enable energy-conscious residents to have all of their daily energy needs met by renewable, on-site solar collection. 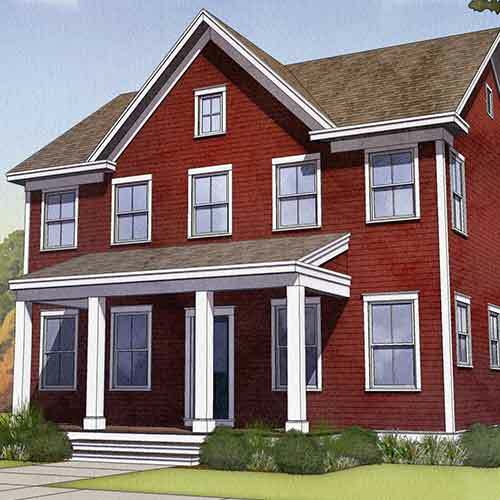 The market-rate cottages each feature 2 or 3 bedroom layouts and range from 1,340 to 1,760 sf. Building upon a site plan concept developed by celebrated cottage neighborhood planner Ross Chapin, Union was asked by the client to refine and expand the initial masterplan while developing the aesthetic and details for the Net Zero cottages themselves. See Other Communities Designed by Union Studio. 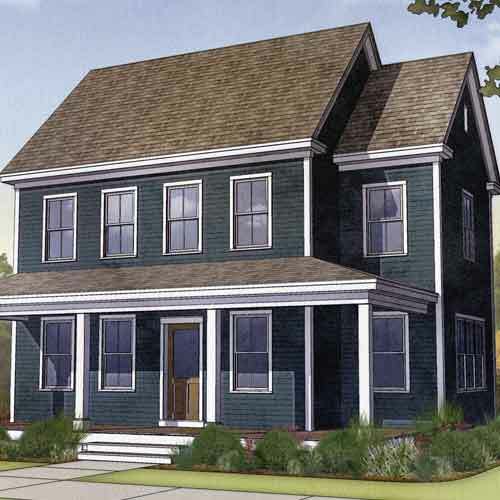 Designed in the tradition of a New England seaside cottage colony, this new community exemplifies casual coastal summer living on Cape Cod, MA. 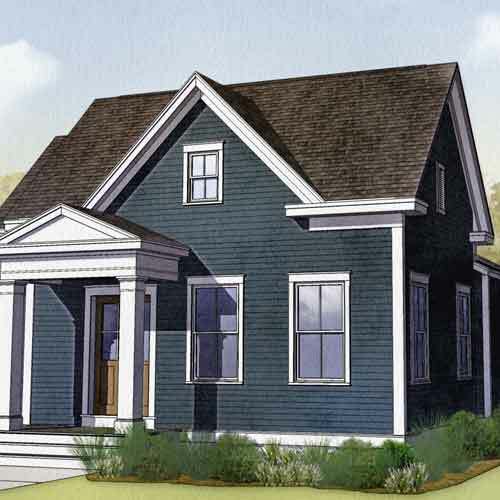 The 65 modestly-sized, 1-3 bedroom seasonal cottages are designed to maximize privacy while bringing the outdoors inside. They offer exterior spaces that function as outdoor rooms and create common areas to connect the community to itself and the seaside. Walking paths, community parks and pavilions connect the cottages to each other and offer settings from which to enjoy ocean views, while a community pool and recreational building create additional places for gatherings and celebrations. 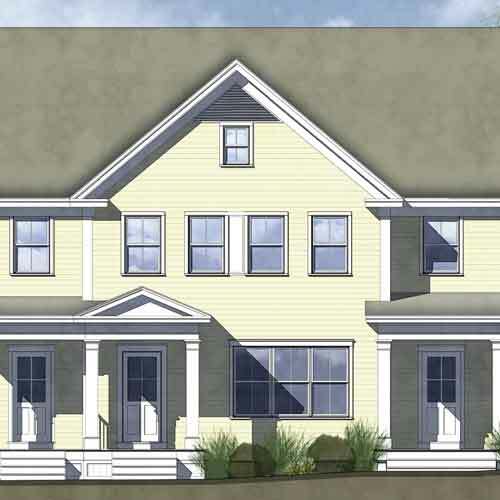 Located in the waterfront, “main street” town of East Greenwich on a .85 acre lot, fifteen units of mixed-income condominiums have been organized into a compact cottage court development. 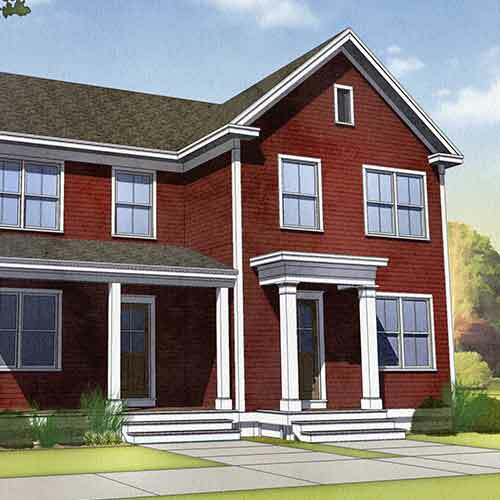 These 2-bedroom, 1,000 SF “cottages” are a mix of building types consisting of free-standing single units, duplexes, and a 3-unit townhouse structure. Despite nine of the units being attached, the overall neighborhood appears as a cluster of 1 ½ story free-standing cottages organized around a linear court and gardens. Bio-swales and rain gardens have been used not only as stormwater management, but as the landscape theme of the neighborhood: small bridges and boardwalks cross and re-cross the spillways and ponds creating a defining image of the landscape. 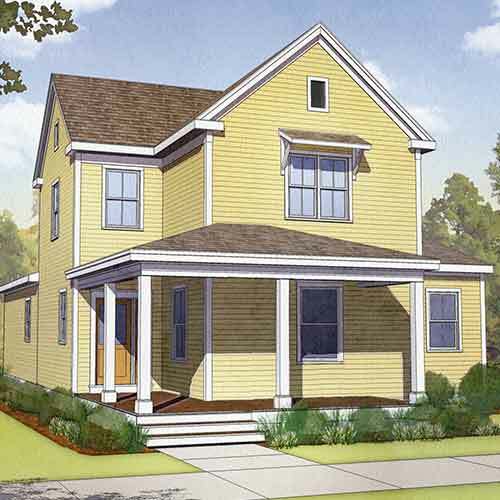 The common spaces are anchored by community gardens, well contained behind white picket fences, and a more formal sod linear court which provides a setting for neighborhood gatherings as well as a fittingly formal address on the public street. 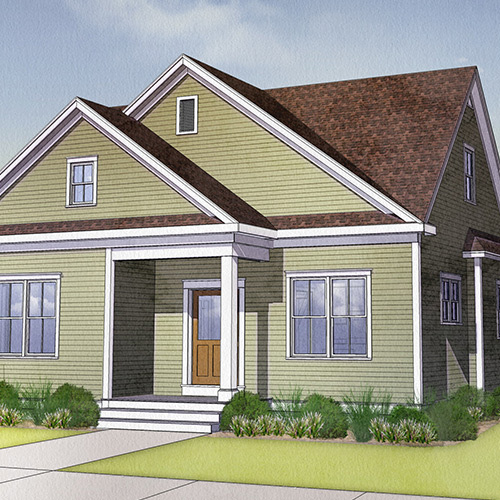 The front porch community offers a unique alternative for home buyers looking for a safe, walkable neighborhood with shared upkeep. 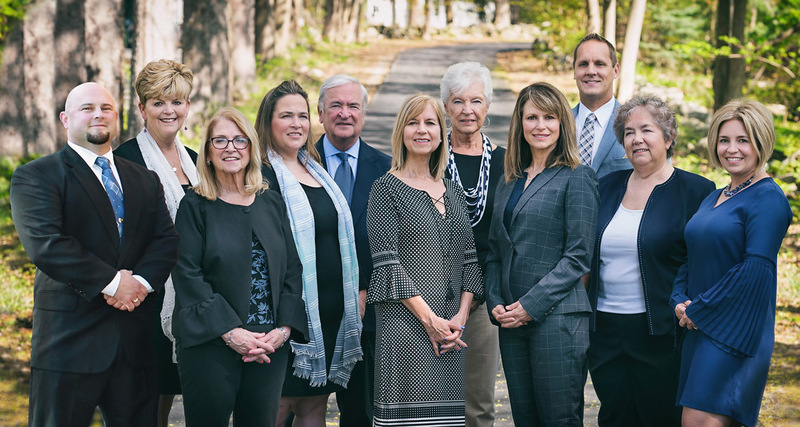 As members of the masterplanning team led by Duany Plater-Zyberk, Union worked with a private developer to design homes and architecture that would fit seamlessly with the traditional upper Hudson River community of Warwick, NY. Building on the forms and materials found within the existing community, Union developed award-winning housing design that recalls the past while providing amenities of modern living. 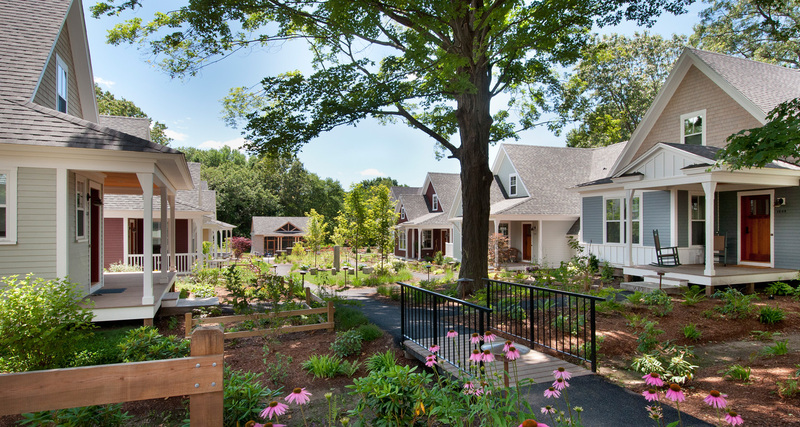 Union designed all of the single-family housing prototypes for this 215 unit traditional neighborhood, in addition to designing the community building, pool and gym — which form the physical and communal heart of Warwick Grove. Following on the heels of our work in Anacortes, WA, Union Studio has been commissioned to design a new prototype neighborhood of 42 cottages at the Resort of Port Ludlow in Washington State. Located on the eastern side of the Olympic Peninsula, this new neighborhood will offer a selection of woodland, park-front and waterfront homes. This unique neighborhood of 100 homes has been designed in its entirety by Union Studio to be the first LEED rated neighborhood of its type in the region. Situated on 24 acres overlooking the San Juan Islands in Anacortes Washington, this neighborhood has succeeded in providing an alternative for small sustainable design that represents the state of the art in sustainable technology, while preserving the traditional character of coastal architecture that is so important to the region. Thorough energy modeling and careful administration of the LEED certification process was instrumental in the early design phases – effort that has been more than recouped in payback to the environment and the overall quality of this remarkable place. Sandywoods Farm is a unique arts and agricultural community designed to combine affordable rental and market-rate housing with a working farm, mixed-use/retail as well as studio, gallery, and performance space for artists, taking a multi-use approach that fosters a strong community identity. Sandywoods includes 50 affordable cottages for rent and a future phase of 24 single-family homes for ownership. In addition, the project preserves 147 acres of land for a working farm, open space, community gardens. Due to the compact planning of the neighborhood, the remaining site has been donated to The Nature Conservancy. A community “Grange Hall” – and other community space within the development — features theater performances, potlucks, cooking classes, and other group events. Power will be provided for nearly all of Sandywoods residents by a 250 kW wind turbine on site. Working with a local nonprofit developer to bring the project to fruition, Union Studio created the masterplan and designed all of the buildings that populate this agri-arts community. In approaching the master planning process, Union Studio endeavors to connect, connect, and connect; to knit seamlessly with the community and to create walkable neighborhoods of residents, services, and institutions. Union Studio’s team of designers have been nationally recognized for their unique approach to community planning and residential architecture. Riverwalk has been selected as the national “Project of the Year” while also receiving the “Platinum Award” in the New Community category at the 2014 Professional Builder Design Awards. Jurors commented that “each piece of this project is well thought out and appealing, from the shared spaces to the interior details.” Winners will be featured in the November 2014 issue of Professional Builder. Sandywoods Farm was selected for a national Multifamily Executive award by a jury consisting of the magazine’s editors, and industry leaders from multifamily organizations including the National Multi Housing Council, Simon Properties, Bozzuto Management Co., Woodfield Investments and KTGY Group. The “Best Re-Use of Land” category recognized three projects from across the U.S. that successfully repositioned land for multifamily use and/or a project developed with specific attention to environmental issues. Sandywoods Farm received an award from CNU New England during the chapter’s annual conference, held at the end of March in Lowell, Massachusetts. 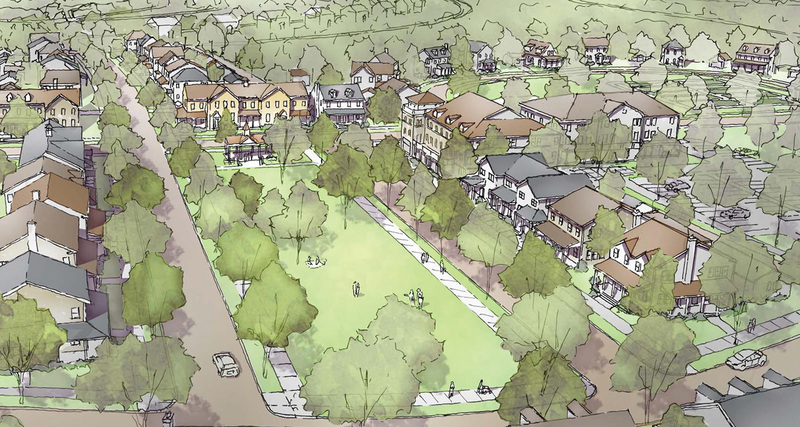 DPA used regional vernacular elements to design the 73-unit community, which is to include market-rate housing, artists’ affordable cooperative housing, common open space, and a small mixed-use crossroads where agricultural goods and artists’ products can be sold. The plan incorporates active agricultural land, much of it permanently protected. The “Timmy Awards” honor outstanding real estate projects that involve rehabilitation of older, historic buildings using the federal historic rehabilitation tax credit, based on overall design and quality, interpretation and respect of historic elements, innovative approach to construction and use of building materials, impact on the community, financial and market success, and sustainability of the project. Every year, the Congress for the New Urbanism (CNU) facilitates an awards program to recognize the very best in New Urbanist design. Winning projects are recognized for their excellence in fulfilling and advancing the principles of the Charter of the New Urbanism, which defines the essential qualities of walkable, sustainable places from the scale of the region down to the block and building. Awarded in the category “Best Single-Family Detached Home 1,801 to 2,400 sf.” The awards are based on submissions from builders, architects, developers, land planners, and interior designers from across the country, and the winners were selected by a national roster of judges. Don Powers and Dan Gainsboro, the leaders of the design and development team, sat down with Boston Globe reporter Kevin Dupont to discuss what makes their communities unique. don: There’s a full-on New Urbanist movement based upon creating, placemaking, and fighting against the conventional way of building which has been broadly termed “sprawl.” Sprawl is what you all recognize as cul-de-sacs, house farms, faux colonials on an acre-and-a-half with no sidewalks and huge garages. New Urbanists are reintegrating communities and bringing in not only a mix of uses, but a mix of housing types, so we get people of different demographics living together with the idea that a well-designed community with a wide array of people is going to be a much more enjoyable and economically resilient kind of community. dan: Resilient in what sense? don: In the sense that the different housing types have the ability for one type to succeed while others are slowing down. There is a term that New Urbanists have borrowed from science that the suburbs that we have created are “mono-cultures.” Mono-cultures are where the whole development is targeted at a specific price range, say between $350k-$400k, with all the same type of house, so if that market collapses the whole thing collapses. That has other ramifications in the social structure of a neighborhood, like the ability to age in place. You come in as a young couple, you rent the apartment, then get a little money together and buy one of the duplexes. After you have kids the duplex isn’t big enough so you buy a single family home across the street. You do all of this in the same neighborhood so as to build lifelong connections. Some of this is idealistic; clearly it doesn’t always happen like that. But even if people aren’t asking or say they are not interested in all that, they will become interested once they enter the fold and they see this internal migration going on. dan: Doesn’t that speak to a sort of a yearning? dan: This is exactly what happened at Concord Riverwalk. When most of the people started to explore what their next move was, it was not like they could plug into a Google search for something that would yield “Riverwalk.” I’m always struggling with how we make people aware. I think the yearning is very real and very tangible. And the question is how do you then start to make more people aware that this actually exists as an opportunity? don: The avenue is finding people who are open to a set of ideas; they are not shopping for a commodity. They are looking for more than a house and know that they want something different. dan: How do you build, how do you design congeniality? don: Interestingly it is not a mystical as it would seem. You can’t create a “faux community,” but you can create the structure that would facilitate community. What new urbanism does is try to cultivate the best chance of community happening by balancing private and public space — by doing very particular things, like putting a house closer to the street because it’s in “conversational distance” from the sidewalk. Part of the reason you are sitting on the front porch is because you want to say hello to your neighbor. And if you don’t, you go to your patio in the back. dan: You don’t need a megaphone from the porch. don: You design the homes closer together to create a sense of enclosure on the street so that street is an “outdoor room.” It is not just a way to get the car to the garage, it’s the primary public space of a neighborhood. The primary effort is to create a sense that the architecture is cooperating to create a public realm. Often, the normal attitude of real estate development is “it’s all about the house.” We are going to give you all the square footage, the beautiful granite countertops, the media center, the backyard with the huge patio and the barbeque. This is the commodity context, where the value is all about the private realm and prioritizing the house as an object: there is no real thought given to the public realm. The primary value that a neighborhood like Emerson Green is trying to create is that sense of community. What you give up in terms of a private backyard that is big enough to play touch football is a front yard that looks out on a common green where you have a block party. You want to create two things, one you want to create an environment that is enjoyable to walk in and two, you want to create some destinations that are worth walking to. There is probably a small market at this point who are looking for net zero, right? That’s their entry point. dan: Yes, the market we found at Riverwalk were buyers who where philosophically tuned into sustainable living. On more than one occasion people arrived at Riverwalk and would take in the whole thing–there was an obvious physical change in their being. I was paying a lot of attention to it. One time I encountered this one woman who said, “I’m in love.” And I was just like, “oh my gosh,” to myself and I was thinking of you and I said, “We really did something here!” We’re hitting people in a really core kind of way. Did she tell you why she was in love? dan: For her it was the intimacy, the architecture, and clearly something resonated with her on a gut level. For a lot of people they can’t necessarily vocalize it but they know it when they see it. don: Yeah, that’s absolutely true. I think some of this strikes me as what’s old is new again. Because, from my own aspect, I grew up in a town center so many of the elements that you’ve incorporated here are just what we had in a town center–this is passé now, but you’d walk to the meat market, the general grocer, the hardware store and the cobbler. don: Can I tell you, walkability is an amenity that people want very badly. dan: I want to talk about that for a second. I try to juxtapose New Urbanism against the setting that I grew up in a suburb of Boston that was pretty car-centric with no real train access. I remember feeling as a kid sort of isolated even though I had my neighborhood friends, we’d play capture the flag and would run around through the streets and stuff, but it still doesn’t remotely capture what I think our new communities are doing. It wasn’t until I moved away and visited a walkable neighborhood that was precisely what you said, it had two roads, a park in the middle, houses on either side and garages were back-fed on the alleys. I was like, “Oh my gosh, this is unbelievable. Boy, I would have loved to grow up here.” This was exactly what I always wanted. In my suburban neighborhood, all of the homes were focused on the road and driveways. Neighborhoods don’t have to be like this. Yeah, the lead architectural building was the garage. don: I’ve always recognized that what we were building in our normal subdivision was deficient. We’ve lived with it so long now that most people can’t conceive of anything else. Especially the level of the planning board, you go to present a traditional neighborhood and they think it’s a radical, it’s dangerous. And you say your highest priced neighborhood in your town a mile away is planned with these exact dimensions — and everyone wants to be there — and you think it’s a radical thing. I think that once buyers compares these walkable neighborhoods to the conventional suburban stuff, they understand the difference and what a difference they can make on their quality of life. But I think that placemaking runs through the whole thing. Everything from the placement of the street trees—we worked very hard to put the street trees closer to the street—to setting the sidewalk behind a ribbon of grass instead of having the sidewalk right on the road. All of these things communicate a certain character – one that you don’t often get in newer developments. dan: So, it’s also self-selecting. It is, and I wanted to touch on that too. So it must be a challenge for you folks in terms of designing that you can’t target one market. So you’ve got to build these with the idea that it’s going to be some single professionals, it’s going to be some young married couples, it’s going to see couples with two kids and the dog, it’s going to be on the verge of empty nesters and beyond, correct? don: In this case, in Phase One alone, we have at least five building types for 18 residences, plus those have options. You are definitely trying to create a series of homes that appeal to different demographics with the ideal that you design it well and all those different types coexist well. In this neighborhood, the primary amenity is more the neighborhood than the house. So every time you add a different housing type and another interesting piece of architecture you create more of the street and that sense of place. What about the idea of not having enough privacy? Of a neighborhood being too social? don: I’ve always said that if you really want to encourage community, give people their own space first. All of the housing projects of the 60’s and 70’s that had this social utopian where you walk out into this common space never work. People retreat. They don’t like to be in that no man’s land. In some ways the porch is literally the buffer between the public and private. If you don’t have that porch, you step out of the front door and you’re suddenly unsafe in a metaphorical way. don: Robert Frost said, “Good fences make good neighbors.” I think is the truth. On a front porch the presence of that railing and grade change create that ability for a person to go up to the edge and talk to their neighbor. don: They’ll be quiet and comfortable. dan: Absolutely, the homes are designed to be both. We are going to offer folks the opportunity to get to a net zero possible platform energy which means the homes will have the ability to produce enough energy as they use over the course of a year. In our efforts to get to net zero possible, the homes need to be air tight. Leaking energy,whether it’s hot or cold air, is a big source of energy loss. dan: I’d be interested in talking about the idea of placemaking and its role in this project. don: Yeah, I think that plan is about creating at least three different kinds of places, four maybe at Emerson Green. One is the sort of the perfect street in phase one where the houses face each other across a road that’s as narrow as we were allowed to make it. Another is the formal green that is faced by townhouses and the multi-family and that has a different aspect and character to it where you might imagine that there’s a block party or ultimate Frisbee game. The third is the crescent which is off to the far left and that is deliberately, in geometry and every other way, more casual so the houses are set further back and there’s a big lawn that is not as formal and that creates a different kind of place where the homes presumably will feel a little more expansive. And then you have kind of a rural street on the back. The point of all of that is to give every fragment of the overall plan its own character and sense of identity. These are a series of neighborhoods within the neighborhood where someone feels like they belong to that particular little neighborhood. 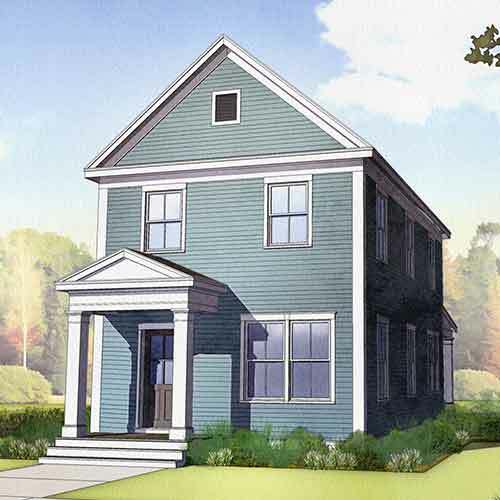 We’ve created collections of 15 or 18 homes that have their own character. But I think that placemaking runs through the whole thing. Everything from the placement of the street trees,—we worked very hard to put the street trees closer to the street—to setting the sidewalk behind a ribbon of grass instead of having the sidewalk right on the road. All of these things communicate a certain character – one that you don’t often get in newer developments. dan: I think what’s cool about that, maybe it’s just because of my background in architecture and interest in design, is that I can imagine on a week night or a weekend just sort of walking around to these different places and experiencing the richness and uniqueness of each one of them. It’s all within a relatively tight area. I can imagine that being appealing to people. How do you handle the interior space of a smaller home? don: If homes are designed well, you can do a lot more with a lot less.